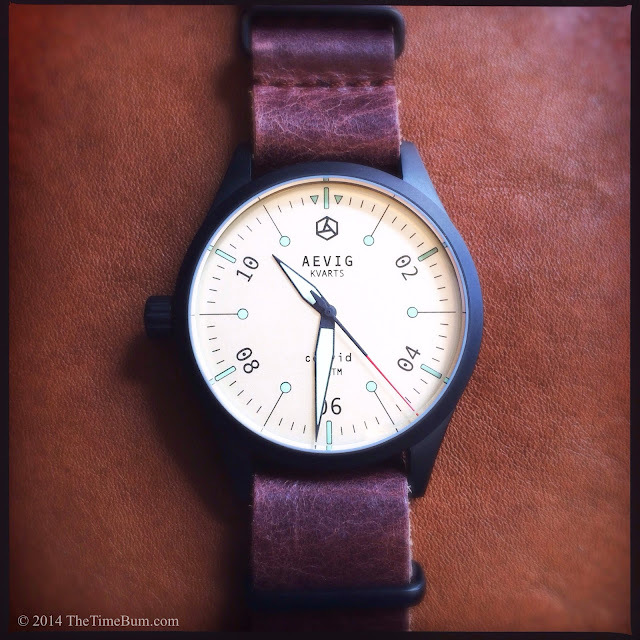 Back in December, I posted a preview of Aevig Watches. Designed by Chip Yuen of the Netherlands, the Aevig line consists of two models, the Huldra automatic diver, and the Corvid quartz field watch. Both watches promised a fresh take on their respective genres, so I pre-ordered a Corvid and waited. Last week, my patience was rewarded. The watch arrived in a slender, padded box. It is simple and practical, and that suits me fine. I have little use for bulky display boxes. The grabber in the packaging was a full set of post cards, with line drawings depicting watches from the movies – a nifty little bonus that showcases Chip's passion for both watches and graphic design. They will find a place of honor here at Time Bum Corporate Headquarters. Packaging cast aside, it was time for the watch. The Corvid is an arresting piece, not because it is big or flashy; it is neither. Rather, it is modestly sized and deceptively simple, with unexpected details that draw you in. As I had hoped, the watch does indeed breathe new life into a traditional style, and harbors a surprise or two as well. 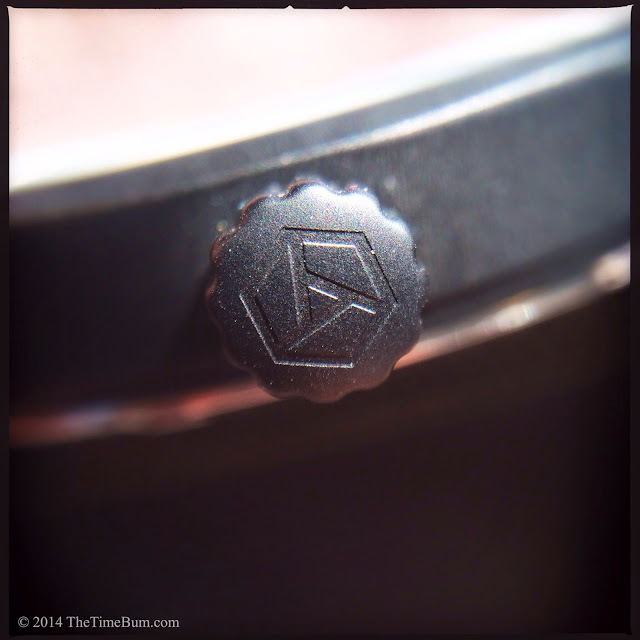 The round case is 40mm across with a matte black finish over stainless steel. The 4mm lugs flow inward and downward from the case, tapering slightly. Overall length is 48mm. The case back is engraved with a tanagram raven (one of the species in the Corvidae, or crow, family). The mineral crystal is ever so slightly domed, giving an overall thickness of just 9mm. The original specs called for an acrylic crystal with a more pronounced dome. I love acrylic, but mineral is perhaps truer to the Corvid's modern ethos. 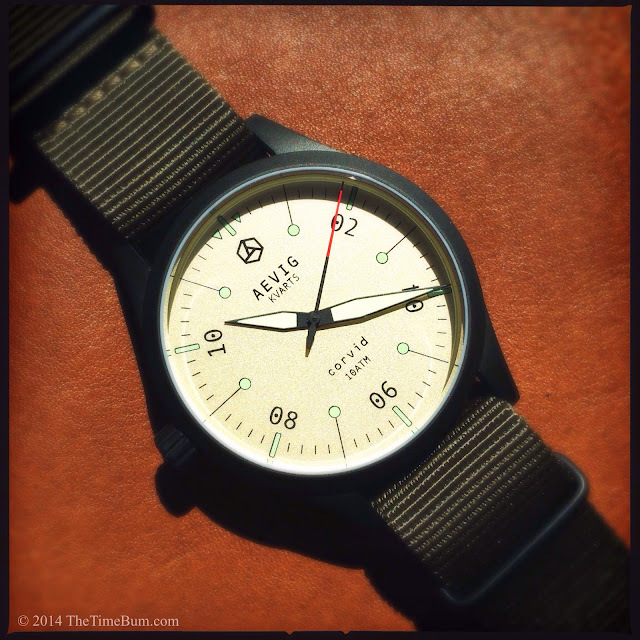 The dial is drawn from both classic military timepieces and modern graphic design. The color is listed as "Sand" but I would describe it as "Champagne." It is a wonderful, textured metallic that ranges from off-white to a warm gold depending on the light. It is certainly not what I would have expected for a field watch with a stealthy black case. All markers are printed in black. 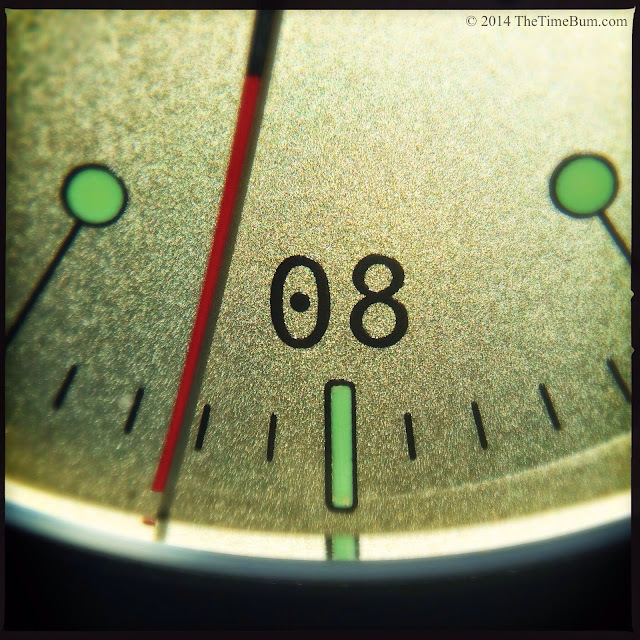 The even numbered hours are represented by bars and two-digit Arabic numerals with a dotted zero that reminds me of an old computer display. They are arranged in a radial pattern with those in the lower half inverted for legibility. Twelve o'clock is represented by the hexagonal Aevig logo, and its bar is flanked by twin triangles. Odd numbered hours are lollypop shaped; their heads aligned inside with the numerals. Text is minimal and balanced, two lines at the top, two below. 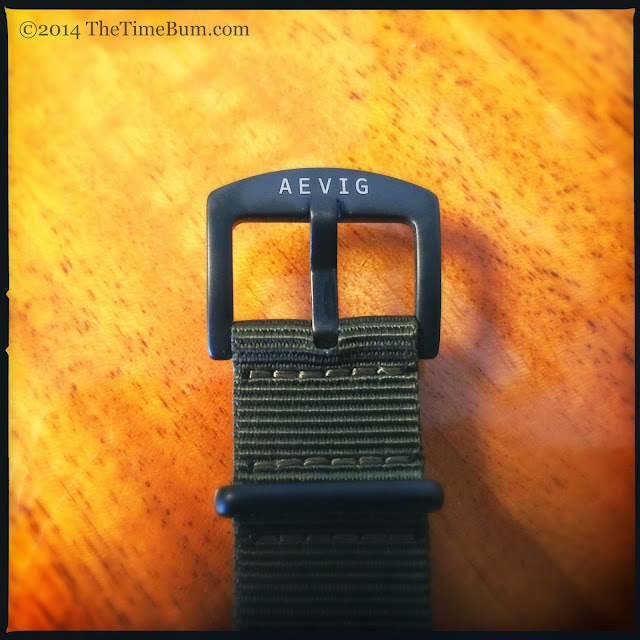 The Aevig brand is uppercase and large, the other text is quite small, and the model name is all lowercase, which seems odd, particularly since it ends with the tall "d", but it works. All lines are thin and black. It is a clean effect. The hands are a thicker version of the traditional dagger shape found on pilots' watches. They extend far into their markers, with the minute hand terminating at the farthest edge of the dial. The pre-production renderings showed thinner, more traditional hands. The revised hands are consistent with the subtle tweaks Chip has made to the other aspects of the watch, but I preferred the slimmer ones. The hands are filled with C3 Superluminova, as are the bars and circles of the hour markers, which creates a unique star pattern when the lights go out. 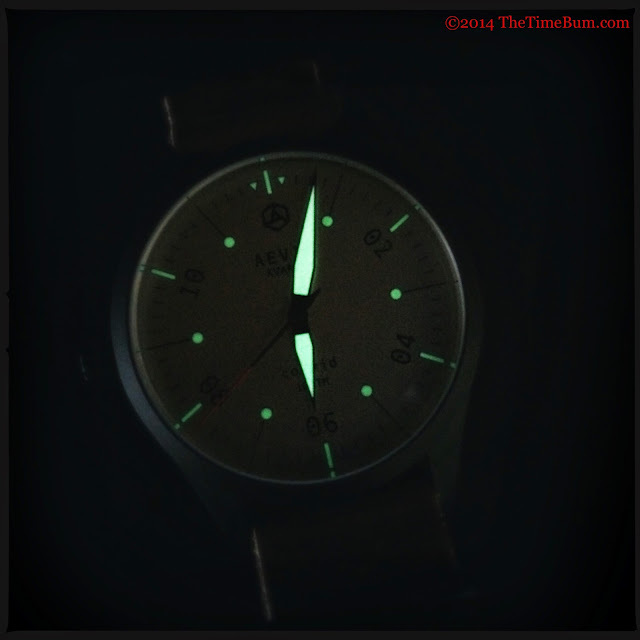 The small markers disappear as the lume begins to fade but the broad hands remain visible. The word "kvarts" is not a false cognate, its English translation is exactly as it sounds. A Swiss made, 5 jewel Ronda 703 runs the Corvid. Normally, I might call this a "workhorse" movement, but given that every other aspect of the Corvid is offbeat, it seems a tad pedestrian. I'm going to call it a "mad cow" movement instead, because it should run like crazy for the next six years until it needs a new battery. 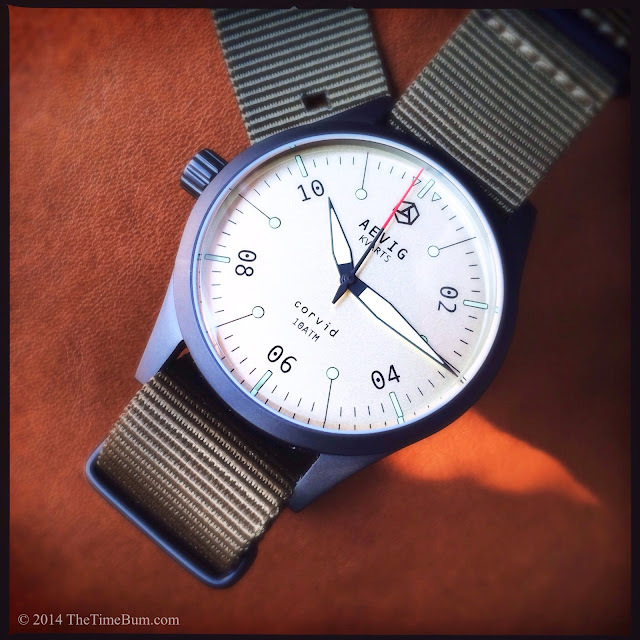 Colorful descriptors aside, this durable quartz is a good choice for a field watch. When considered along with with 100 meter water resistance, screw down crown, and scratch resistant surfaces, it is clear that the Corvid is made for real-world use. 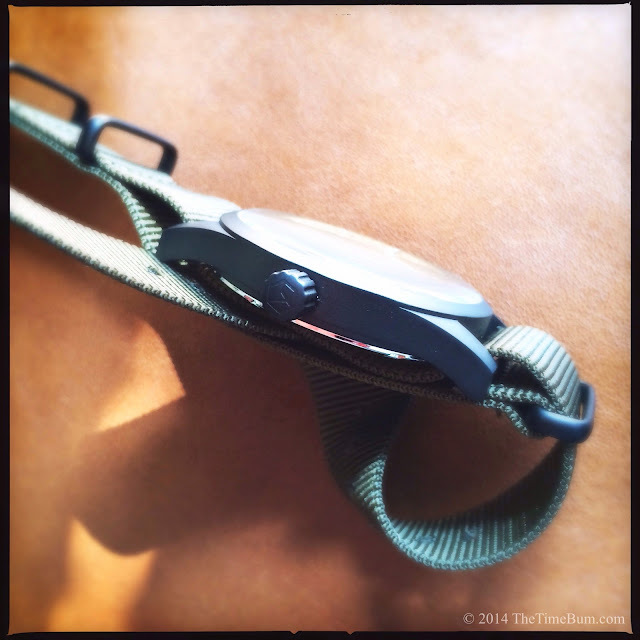 The watch is supplied on a 20mm olive nylon NATO strap. It is a heavier weave than most, with a slight sheen that complements the metallic effect of the dial. It is stitched with tan thread, providing a subtle contrast. Hardware is matte black like the case. Unlike most NATOs, it has a removable buckle with a broad tang and a square frame. The buckle is signed, but printed instead of engraved. This is a small matter, but I would have preferred engraving for both aesthetics and longevity. The strap is a perfect match in both color and character, but I could not resist swapping just once. Clearance between the spring bar and the case is a bit tight. You can pull the stock strap through, but I would recommend removing the bars to prevent the strap from rubbing against the case. I popped on a distressed chocolate leather NATO from Cheapest NATO Straps that warmed up nicely against the gold tones in the dial. The Corvid is a unique piece. Just about every aspect is both familiar and novel at the same time. As one industry insider remarked, "It's Bauhaus meets Alien." 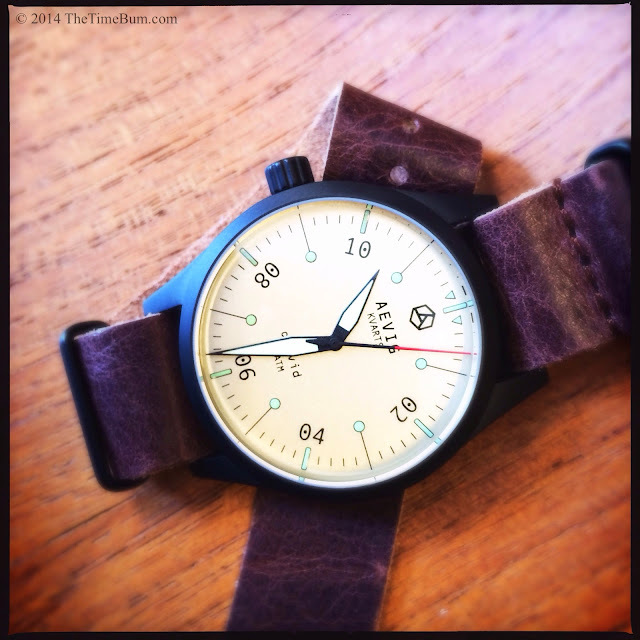 There are plenty of field watches to choose from, but Chip has taken that basic pattern and deftly tailored every aspect in a way that is unexpected, and ultimately quite satisfying, like a great new band that covers your favorite song. Best of all, he has done so for only €119, or about $129 USD excluding VAT. 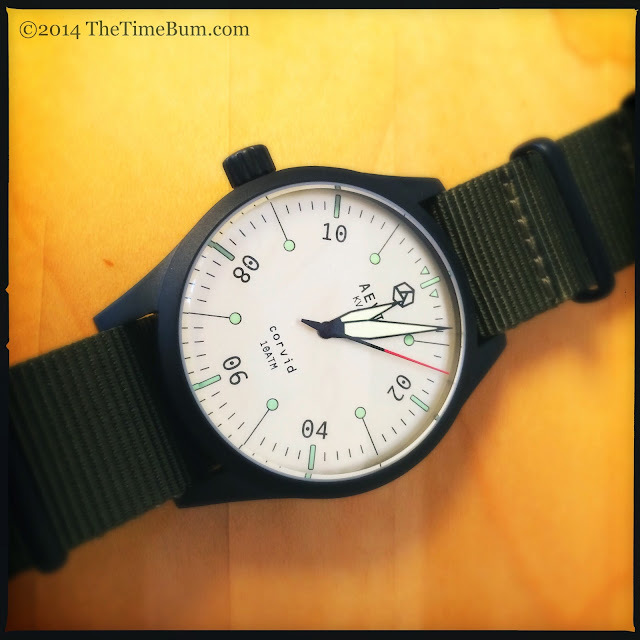 The sand dial is sold out, as is the black dial, but some green dial models are still available. Con: Lefty is not for everyone. Disappearing fast. Sum: A refreshing take on an old standard. The Time Bum approves. * Like everyone who says that, I'm lying. That awful pun was totally intentional.